This 1884 high profile, historic building originally housed a non-gambling casino and was the showpiece for the Town of Narragansett. 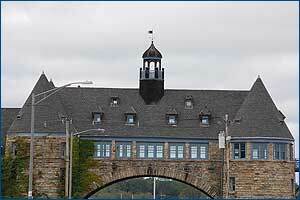 With a 50-foot arch and two attached stone turrets (The Towers), this structure is one of Rhode Island’s gems. Tragically, in September of 1900, the casino burned to the ground from a fire that began in one of the nearby hotels leaving only the stone structure remaining. When the Town decided to restore the cupola that was destroyed in the turn-of-the-century fire, there were obstacles to overcome before the process could begin: high gale force winds from the ocean side, congested street traffic, and tourists walking the sidewalks below the tower, all had to be carefully considered. The scope of work involved stripping approximately 150 square feet of roof shingles and replacing them with a high wind-resistant product along with the replacement of windows with newer energy efficient ones but maintaining the original impression structure. The specifications called for an exact cupola replication. The cupola was constructed off-site, trucked to the site and hoisted by crane to the roof and secured into place. By overcoming the obstacles of Mother Nature and a busy tourist site, the focal point of South County was recaptured for the Town of Narragansett.